Eliminating manual procedures for processing direct and indirect orders is critical for successful compliance and supervisory functions. 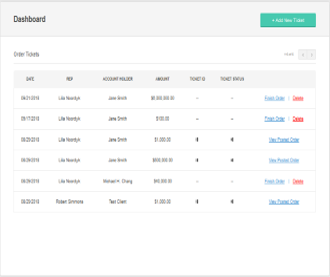 Our Transaction Management System (TMS) provides a centralized automated portal for your REPS and internal staff to enter, track and report on all direct transactions. Fully integrated with our Branch Supervisory module, Transaction Processing automates entry and tracking of orders while providing critical workflows and validations to ensure proper suitability, licensing and compliance procedures are followed.